sitting on the wall of his mausoleum. and I asked, for what? a harvest — an orchard of a man. from his lungs and held it out to me. Everything, he said, is a way of remembering. Previously published in Arc Poetry Magazine (2012), Best Canadian Poetry 2013, Best of the Best Canadian Poetry, and Sweet Delivery (Oolichan Books, 2011). 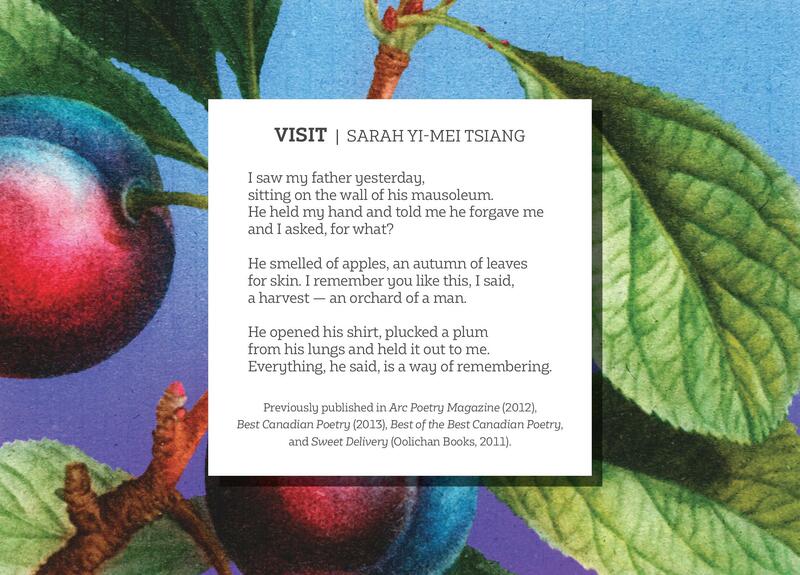 Sarah Yi-Mei Tsiang is the author of 10 books, including picture books, poetry, and fiction. Her award-winning work has been internationally sold and translated. She is currently an adjunct professor of Creative Writing at the University of British Columbia.